In geometry, curvilinear coordinates are a coordinate system for Euclidean space in which the coordinate lines may be curved. These coordinates may be derived from a set of Cartesian coordinates by using a transformation that is locally invertible (a one-to-one map) at each point. This means that one can convert a point given in a Cartesian coordinate system to its curvilinear coordinates and back. 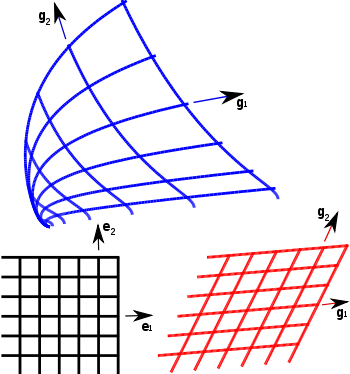 The name curvilinear coordinates, coined by the French mathematician Lamé, derives from the fact that the coordinate surfaces of the curvilinear systems are curved. Well-known examples of curvilinear systems are cartesian, cylindrical and spherical polar coordinates, for R3. While a Cartesian coordinate surface is a plane, e.g., z = 0 defines the x-yplane, the coordinate surface r = 1 in spherical polar coordinates is the surface of a unit sphere in R3—which is curved. Coordinates are often used to define the location or distribution of physical quantities which may be scalars, vectors, or tensors. Depending on the application, a curvilinear coordinate system may be simpler to use than the Cartesian coordinate system. For instance, a physical problem with spherical symmetry defined in R3 (e.g., motion of particles in the field of a point mass/charge), is usually easier to solve in spherical polar coordinatesthan in Cartesian coordinates. Also boundary conditions may enforce symmetry. One would describe the motion of a particle in a rectangular box in Cartesian coordinates, whereas one would prefer spherical coordinates for a particle in a sphere. Many of the concepts in vector calculus, which are given in Cartesian or spherical polar coordinates, can be formulated in arbitrary curvilinear coordinates. This gives a certain economy of thought, as it is possible to derive general expressions, valid for any curvilinear coordinate system, for concepts such as the gradient, divergence, curl, and the Laplacian.